The year is moving along and there are now definite signs of autumn in the Gardens. While there is not yet any real autumn colour, some trees have begun to shed their leaves, as can be seen with this Whitebeam (Sorbus aria), right, on th big lawn near the house. 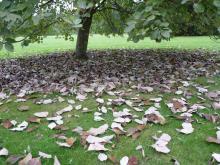 The fallen leaves have formed a thick carpet around its base, even though there are plenty still on the tree. Whitebeam is not known for autumn colour but for the silvery underside of its leaves, which shows up well during the season, especially when blown about by the breeze. The house martins which nest on the water tower raised two broods and have now departed for Africa. In recent years the number breeding here in the UK has fallen by two-thirds, according to the BTO.Theirs is one of the epic migrations over the Sahara Desert, a trip fraught with hazards. The desert is expanding, and finding water en route is a chancy business. The young of the second brood have only been on the wing for a couple of weeks and must now face this long flight. This spring they were late returning and didn't arrive until May, but most years they are back in April. Exbury Gardens is well-known for its splendid displays of fungi in the autumn, and the first ones like these boletes (left), are beginning to appear on the short grass lawns. It is difficult to find one in perfect condition as they are beloved by slugs as well as mice and voles, so they often have a pocked and pitted appearance, or look chewed (see right). This is also the time of year to look for fruits and seeds on the flowering trees and shrubs. One of the more spectacular autumn fruits is produced by the Spindle bush (Euonymus europaeus) (left) which has four deep pink lobes which will soon open to reveal bright orange seeds. The leaves also turn red later on for a lovely splash of autumn colour. There are some bushes that you pass as you first come into the Gardens from the entrance kiosk, and others along the railway line.